On Tuesday, Ukraine's government survived a no-confidence vote, hours after President Petro Poroshenko urged Prime Minister Arseniy Yatsenyuk to resign. Arguably more surprising than the vote or its outcome was the openness with which the Western media talked about Kiev as a failed 'investment' for powerful Western patrons. Earlier this week, the government of Prime Minister Arseniy Yatsenyuk survived a vote of no-confidence in the country's parliament, despite a rapid decline in the government's approval ratings, and Poroshenko's explicit demand that the government step down. On Monday, the Poroshenko Bloc parliamentary fraction said following a review that it considered the cabinet's work in 2015 as 'unsatisfactory', and that it would support a vote to dissolve the government. Following the failure of the vote, absent an early disintegration of the country's governing coalition, parliamentary rules state that the MPs will be allowed to table the government's resignation only at the next session of parliament, slated to open September 6. To Ukraine watchers, another political scandal in the country is hardly a surprise, with post-Maidan Kiev rocked by a new scandal every other week. What is remarkable, however, is the way in which much of the Western English-language print media has covered the Poroshenko-Yatsenyuk tussle, repeatedly and openly using words like 'investment' and 'stakeholders' to describe the patron-client relationship with Kiev. For openers, Reuters, in a paragraph wedged between a description of the no-confidence vote and the corruption plaguing the country, curiously recalled for some reason that "Ukraine's international backers have invested much money and political capital backing the government in its stand-off with Moscow…following the overthrow of Kiev's pro-Russian president by protesters." US-funded broadcaster Radio Free Europe, meanwhile, provided a similar analysis, adding that "the push to eliminate problems like bribery, kickbacks, and preferential hiring for wealthy insiders has proceeded at a slow pace, resulting in growing frustration both inside Ukraine and," perhaps even more importantly, "among Western officials and lenders." Foreign Policy magazine was more self-critical, dragging both Yatsenyuk and Poroshenko through the mud and suggesting, somewhat disingenuously, that "the West shares the blame for the reformers' failure to win the fight for change in Ukraine." "As direct stakeholders in its future, with billions of dollars already invested through bailout loans and aid, the country's foreign partners and supporters have been remarkably idle in pushing for specific reforms," the magazine noted. "Many have closed their eyes to exactly how much power the vested interests among the post-revolutionary [post-Maidan] political elites still wield. 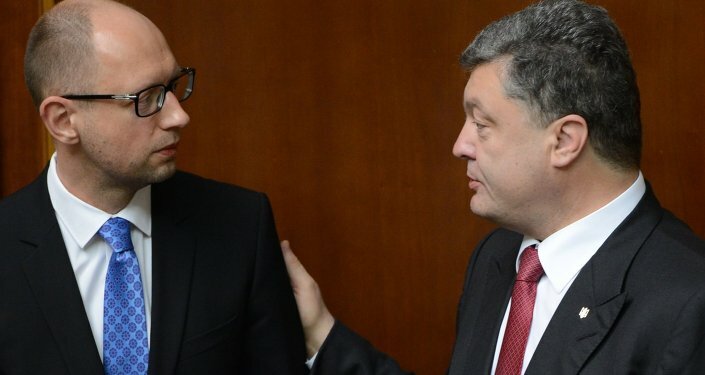 Western policymakers and diplomats have rallied for the well-spoken Prime Minister Yatsenyuk while ignoring his almost two-decade background in dirty Ukrainian politics and reports of his close allies' alleged involvement in corrupt schemes." Moreover, the magazine added, "not a single question was asked when President Poroshenko staffed his administration with former business partners and friends with dubious backgrounds while refusing to sell his own vast corporate assets, as he had promised." Ultimately, Foreign Policy warned, "Ukraine's Western partners may find themselves facing much higher costs to fix the mess," lest the West wants to see "a full-blown Ukrainian collapse." But perhaps vehement Russia critic Adrian Karatnycky, a senior fellow at the Atlantic Council, was the most honest about Washington and Brussels' true goals in Ukraine. Western officials, he explained in his op-ed for Politico, were against the dismissal. 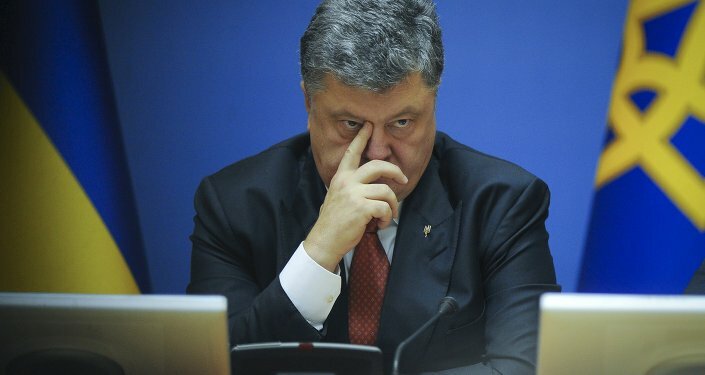 "Reliable sources in Western capitals and in Kiev confirmed that US and European leaders looked unfavorably on the plan and sent two emphatic messages to Ukraine's president: 1) add more independent professionals and reformers to the cabinet; and 2) avoid the collapse of the government and new elections," the analyst noted. Bluntly admitting just how dependent the contemporary 'Ukrainian project' is on Western financial and political support, Karatnycky, the former president of the US government-affiliated NGO Freedom House, emphasized that the West is not just a bystander: it is a 'stakeholder'. "Western leaders, who have put together a $27.5 billion bailout [loan] package for Ukraine, are more than mere bystanders; they are stakeholders in Ukraine's success. If there are to be changes at the top of Ukraine's government, they told Poroshenko, he must guarantee that such changes will ensure stability." Who but the most skeptical of Washington and Brussels' critics could have guessed, two years after the Maidan 'revolution of dignity', that the Ukrainian leadership's political decisions would turn out so openly to be the prerogative of Western 'stakeholders'. Or that Western media would talk about it so openly? 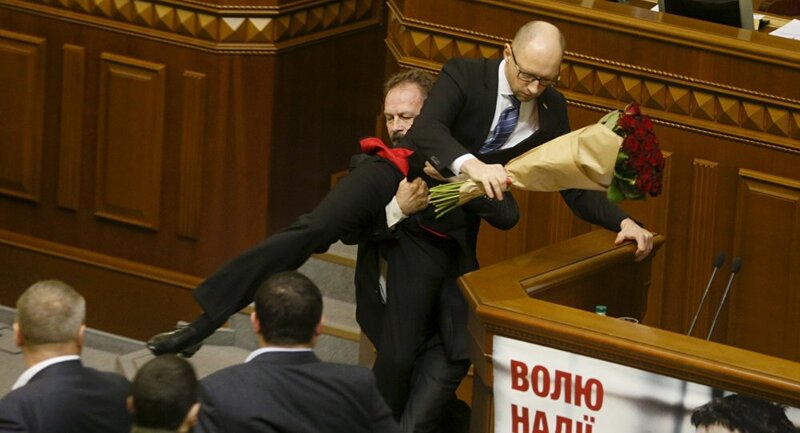 "Western leaders did not issue their demand because they support or trust Yatsenyuk," Karatnycky explained. "They did so because they knew that a period of political uncertainty can erode support for the maintenance of sanctions against Russia." "The multiple messages seem to have had the desired effect," the pundit wearily admitted. "By failing to prevail in a vote on Yatsenyuk, Poroshenko bought the prime minister a half-year before a new vote can be held to strip him of his office –after two additional tranches of IMF aid are likely to come and the EU has made a June decision to extend sanctions against Russia." In other words, the message seems to be, let Ukraine struggle and slowly disintegrate politically, socially and economically – what's most important to Kiev's Western 'stakeholders' is that they get to extend their anti-Russian sanctions, and ultimately, keep Kiev and Moscow from normalizing their political and economic relationship, no matter the ultimate cost.